We dare you not to grin a little when you check out this fan art using Mega Man sprites to depict Marvel's greatest characters. Mega Man seems to be getting some great fan tributes recently. Aside from the Mega Man mod for Doom II, an impressive 8-Bit panorama featuring all the big-name Marvel Universe characters has popped up on the Web. Spoiler alert: This thing is absurdly cute. 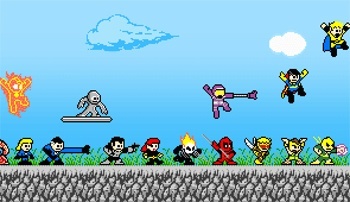 Self-proclaimed "crappy sprite artist" Irene Y Lee ("suzuran" on deviantART) created this panorama after she decided to give Megaman Spider-Man's abilities. "I liked the idea so I just started making Megaman shoot a webshooter," Lee explains on the DeviantArt page for this piece. "[My] coworkers loved it so much that they asked for more powers, and it eventually turned into me just turning everyone into 8-Bit sprites." Just about everyone who's a remotely major player in the Marvel Universe is here. In the section pictured here, from left to right, the following characters make an appearance: Ben Grimm, Human Torch, Invisible Woman, Mister Fantastic, Silver Surfer, Nick Fury, Black Widow, Ghost Rider, Machine Man, Deadpool, Yellowjacket, Dr. Strange, Hercules, Iron Fist, and The Sentry. The full-sized version of the image even includes some of the big-name villains, like Apocalypse, M.O.D.O.K., and Dr. Octopus. Personally, I think Lee is selling herself short as an artist. Customizing sprites might not seem like much of a challenge, but the panorama is very well done, with costumes and character details nicely implemented. More importantly, Lee's other work in her portfolio is absolutely lovely.